Fashion's thing for cellophane is real. 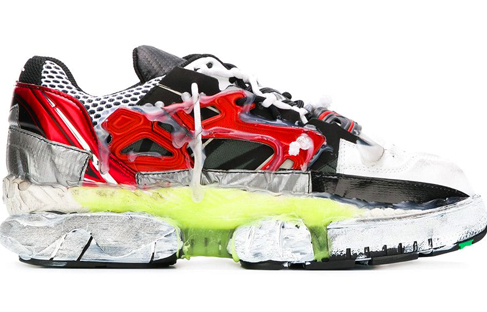 Plastic, PVC and Perspex accessories are big, and while the plastic fantastic vibe has been kicking around for a few seasons, designers have been dishing out layers of shiny, transparent synthetic all year long—on sneakers, as plastic jeans cut like Levi’s 501s; as sandals, bags and a whole lot more. 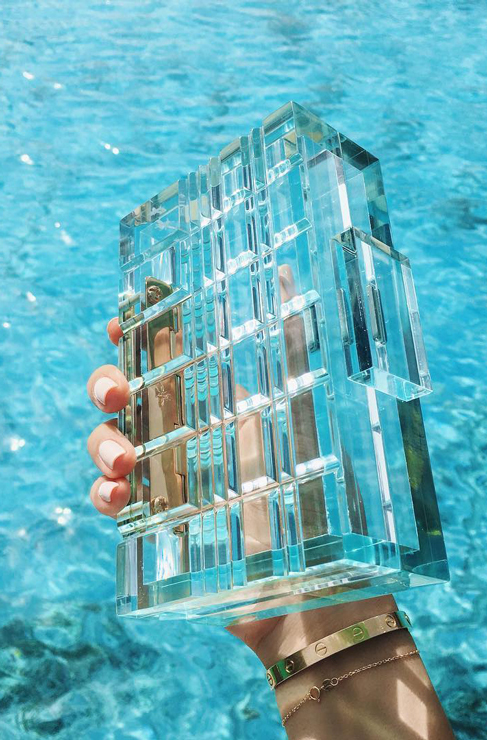 We can totally see through this one, and it might just be the shiniest, most spectacular thing you definitely need to see out 2018. This time around, fashionable plastics have emerged in a rainbow of glossy cellophane colours. It’s yet another welcome style cue from the 90s (inflatable couch, anyone? ), bubbling up with a touch of fresh irony too for good measure. As part of her finale at Céline, Phoebe Philo gave us plastic shoppers that put a hefty price on throwaway culture. Jil Sander and Off-White have since followed suit. It’s not a plastic-free world yet, but fashion's sending out a crystal clear message just the same. Iridescent shades of pearly plastic have permeated recent collections at Maison Margiela. At the S/S 19 menswear shows, No.21 threw beachy shorts finished in shiny plastic red and bright blue down the runway and Dries Van Noten did dusters and anoraks in translucent primary colours. Are you ready to bare all with a touch of tint too? Let's begin with that foolproof fashion equation to clear up the numbers. Plastic's definitely not the most practical or comfortable of fabrics (cue a bit of sticky condensation). Never mind though, this season's plastics have room to breathe and to hide. Layer your wearable PVC with cottons, go for icy accents of coloured plastic and pick up accessories with built-in coverage. Linings and bags within bags are making this tricky trend possible. 1. EDITOR'S PICK: Brashy Studios pink Crystalline PVC jacket, $355 at Brashy Studios. Go all in and get the matching five-pocket jeans. 2. Jil Sander Market bag, approx. $860 at Jil Sander. 3. Maison Margiela low-top Fusion sneaker, approx. $3,140 at Maison Margiela. 4. L'Afshar Crushed Ice clutch, approx. $968 at L'Afshar. 5. JW Anderson men's low top Chuck Taylor Converse, approx. $215 at JW Anderson. 6. Deadly Ponies Mr. Frizzling PVC shopper, $399 at Deadly Ponies. 7. Maison Margiela mutlicolour hologram pouch, $688 at Maison Margiela. On the downhill stretch to payday? 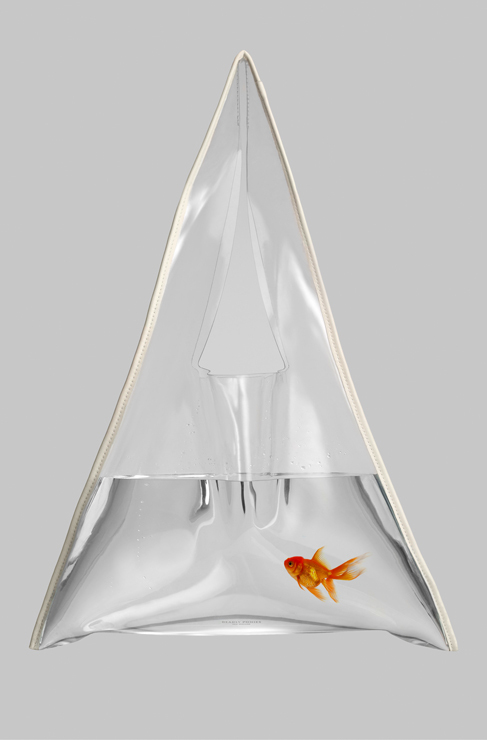 Be crystal clear at the beach this summer with Opening Ceremony's PVC tote.